The building is on fire. Help people escape a gruesome death by bouncing them into a waiting ambulance. Move the fire fighters left and right to position the trampoline in the right location; you can tilt the device left/right, tap the desired location, or press in the left/right edges of the screen to move the fire fighters. Each bounce earns 1pt, a bonus exists when 300pt is reached - can you reach it? The GW games is what got me hooked when I was a kid back in the day! Now my 7 year old son saw a GW character on his Wii game and was asking me alot of questions about it. Now I can finally show him the "Old School" style of addicting gameplay I loved!!! GW Fire was my favorite of them all - so when I saw it on Itunes, I did not even look at the price and VERY QUICKLY purchased it. What can I say, This is exactly how I remembered it. WOW!!! Can I give 10 stars? It really deserves it! One of my favorite Game Watch games from my childhood. Great to have it again on my iPhone. I'M TWELEVE YEARS OLD AGAIN!! This is exactly the game you remember. It even has some very nice shadowing on the graphics that emulate the printed graphic layers on the original game unit. A lot of care was taken with this. It's very well done! Klasse !!! Das Spiel gab es in den 80ern als Spiel von Nintendo für unterwegs. Heute ein echter Klassiker. Wer auf Grafik verzichten kann, wird es lieben. Einfaches aber dennoch spaßiges Gamplay auf 2 Schwierigkeitsstufen. Classic! This game existed in the 80's as a Nintendo game on the go. Today it is a real classic. Who can complain about the graphics - they are perfect!. Simple, but fun with two levels of gameplay. Like all GW's watch and game modules, these are true reproductions. Now looking forward to my favourite - manhole. Great job guys. 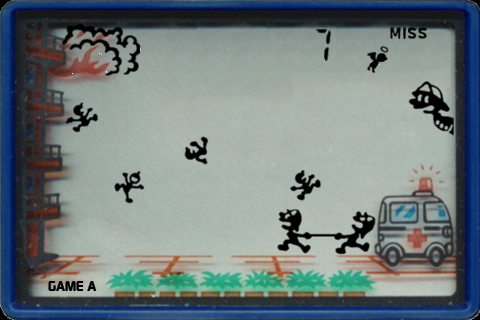 Fire was my favorite of the original Nintendo Game and Watch games. I recall controversy surrounding this game when it was first released as a handheld. Some people thought the bouncing people looked like babies, and objected to their becoming angels when you miss. There were articles in the press. To me, this warped sensibility just made the game that much more appealing. And it still does.